The upper echelon of instrumental exploration, arrangement, composition and performance. 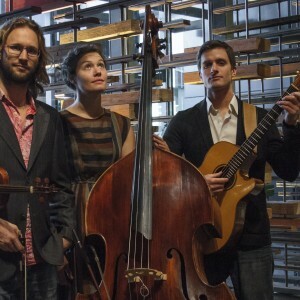 Renowned acoustic chamber-folk trio The String Contingent have toured extensively in Australia, New Zealand, the UK and Scandinavia, with their unique sound that confidently walks the line between folk, classical, jazz and bluegrass. 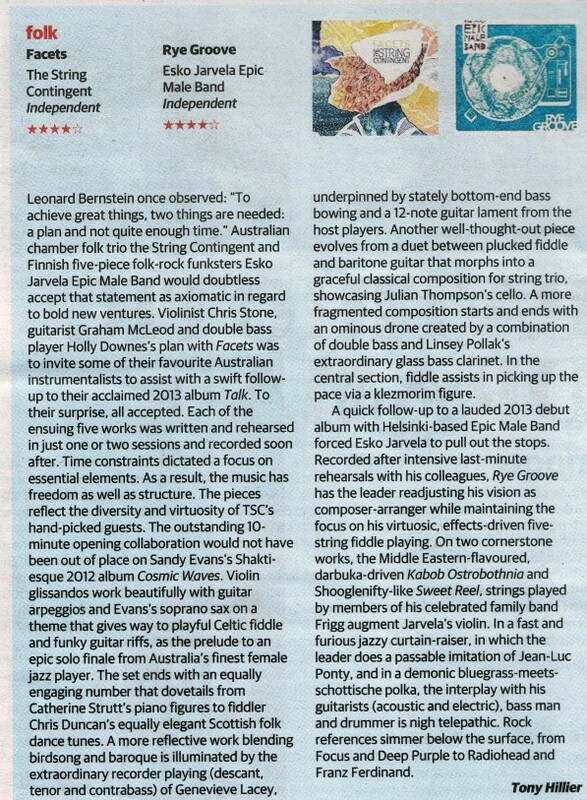 Australians, Chris Stone (violin) and Holly Downes (double bass), with Scotsman Graham McLeod (guitar) share a musical ethos that showcases the individuality of each musician and eclipses genre. Young stalwarts of the Australian acoustic music scene, TSC are equally comfortable rocking a festival stage or playing for an intimate crowd. In performance, their camaraderie and cheeky banter shines through, as does their passionate musicianship and instrumental skills; a joyful combination of precision, refinement and beauty, balanced with visceral energy and drive. 2017 sees the launch of their fifth album, Iterations, recorded in the beautiful acoustic of the Windsong Pavillion at Four Winds, Bermagui NSW. Holly, Chris and Graham embarked on a two-part residency at Four Winds to explore different creative approaches to music-making. The resultant album features music that they developed at and between the two sessions, and live free improvisation, which they collectively and spontaneously created in concert. 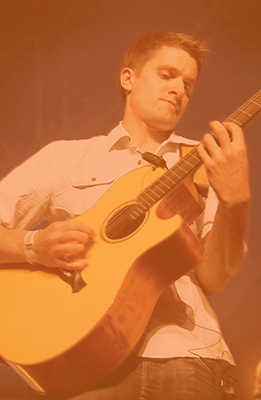 Graham McLeod is a Scottish guitarist, composer and educator who holds a Bachelor of Contemporary Music from Napier University and a Postgraduate Diploma of Education from Edinburgh University. His life as a busy electric guitarist took a sharp turn after meeting Chris and Holly in 2008 which prompted him to dust off the acoustic, lift his strap and buy some thicker picks. 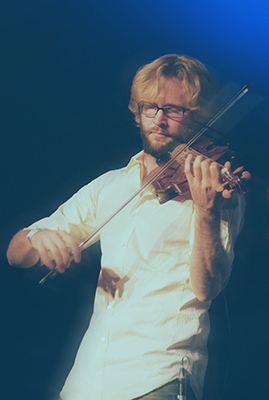 Graham resides in Edinburgh, and commutes frequently to tour in Australia with The String Contingent. When at home he teaches guitar and performs regularly, including work with celtic-funk band Modhan and singer-songwriter Kat Healy. A passionate animal lover, cats cause the most daily distraction for Graham, and like any self-respecting Scotsman he enjoys fine whisky. 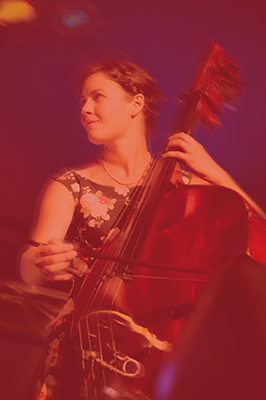 Holly Downes is an Australian bassist, composer and educator who holds a Bachelor of Music from the Australian National University and was nominated for the Freedman Classical Fellowship in 2014. As bassist of The String Contingent she has re-invented the role of the instrument, showcasing its melodic capabilities and exploring diverse accompaniment textures and techniques. Holly also performs regularly with Melbourne-based singer songwriter, Lucy Wise, and is a member of the Canberra-based contemporary chamber music group, The Griffyn Ensemble. Holly holds Graduate and Postgraduate Diplomas in psychology from Melbourne University, where her research included auditory processing and pitch perception in music. Her preferred pastimes include fibre crafts and consuming cheese and sweet treats. We are looking forward to returning to the bustling town of Candelo, this time for the Village Festival. We're performing in the Town Hall at 2pm on Saturday 27th April, but the festival runs all weekend and is packed with a diverse and high quality program - check it out through the link below. We are delighted to share this concert with 'Blue and Sentimental' - an Australian jazz duo featuring Emily-Rose Sarkova (Accordion & vocals) and Luke Chapman (Guitar). Inspired by a mutual love of ‘gypsy jazz’, folk, tango, fusion, classical and all the in-betweens, their music is alive with the new sounds of originals as well as sentimental salutes to the old classics in jazz. A Prelude in Tea concert is the perfect Sunday afternoon out. Don't miss our last concert for this years festival! See you at the Fitzroy venue. Join us for the special album launch concert of our sixth CD 'From Here or Somewhere Else', featuring music composed during our epic 2018 trip along the Savannah Way from Cairns to Broome! Join us for our first gig of the festival in the Marquee venue! We're excited to be playing at the National Folk Festival again - it's a definite favourite for musicians and audiences alike. If you haven't been before make this the year to come along! We're performing three times over the weekend and will be launching our sixth album, From Here or Somewhere Else, at the festival. Delighted to be heading out to the Cullulleraine Music Festival - we're playing Sunday afternoon, but the festival runs all weekend so check out the great line up through the link below. We are delighted to be presenting music from our brand new album 'From Here or Somewhere Else' which showcases compositions from our 2018 trip along the Savannah Way, from Cairns to Broome. Join us in the beautiful space of the Salon room for a special evening of music. One of the great small-town festivals - don't miss it! If you're in this area and would like to come along, please email us at thestringcontingent@gmail.com. We're returning again to the Old Courtroom in Gunning hosted by the Gunning Focus Group. Bookings and enquiries please call (02) 4845 1566. Join us in the lush acoustics of St Jude's for an evening of music hosted by the St Jude's Music Association. Tickets available at the door: $30, students $20, under 16s free! Doors from 7:00pm, concert starts 7:30pm. Call 0434 993 973 for bookings and enquiries. Stoked to be finally returning to the fantastic 'Wellyfest' - we have very fond memories of playing at this festival back in 2011. Our band mascot Wally T. Wombat even had his first sleep over with a five year old fan after stage diving at the end of our last gig! Join us for an evening of music at the Barrel Room, Tauranga's cool new music venue that boasts a fine selection of craft beers, single malts and wine. Tickets through the link below, see you there! Stoked to kick off our NZ mini-tour playing at Cafe One2one in Auckland. Bookings through the venue on 09-378-1611 or pop in. Looking forward to performing in Yack, hosted by Arts Yackandandah - click the link below for all the details. This concert is the culmination of Stringmania Camp, a week long intensive music camp that celebrates and explores the traditional arts - music, dance, language and song - set in the beautiful Yarra Valley of Australia. Featuring world-class performances by Alasdair Fraser, Natalie Haas, Jaron Freeman-Fox, Simon Nyberg, Kavisha Mazzella, Jingjing Lu, Dr Nicholas Ng, Rachel Johnston, Greg Sheehan, Emily-Rose Sarkova and The String Contingent along with a celebration of the musical achievements of camp participants. Tickets through trybooking link below, see www.stringmaniacamp.com or call 0402 442 511 for more information. Stringmania! is a residential string camp and a meeting point for musicians who are passionate or curious about traditional music. Directed by the renowned fiddle player Alasdair Fraser, join The String Contingent and a host of amazing tutors to explore music together in the beautiful Yarra Valley. Click the link below to learn more about the camp. The first concert in our 2018 tour of Victoria and NSW after we come back from our exploratory tour along the Savannah Way from Cairns to Broome. We'll have some new music and stories for you along with old favourites and repertoire from our latest album 'Iterations'. Click the link below to book and join us for an evening of music in the beautiful acoustics of The Monastery! Delighted to be finally playing in the 'big smoke' of the north, at the renowned Darwin Entertainment Centre. Click the link below to book your tickets now. After our exploratory tour across the top of Australia we are exciting to be finally heading to 'The Middle' and can't wait to perform at the renowned Araluen Arts Centre. Click the link below for more info and to book your tickets! So excited to be heading up the Dampier Penisula as part of our exploratory tour across the top of Australia! Full details soon. We'll be passing through Kunnanurra as part of our exploratory tour across the top of Australia and are stoked to be playing a concert there. Full details soon! As part of our exploratory tour of Northern Australia we are delighted to be playing at Godinymayin Yijard Rivers Arts & Culture Centre. Full details coming soon. We are delighted to be heading up to Cooktown to perform a sunset concert in the botanic gardens at Nature's Powerhouse. Tickets available at the door (cash or card) $30, and includes nibbles. No charge for young people under 15. Call Chris on 0434993973 to pre-book or for further information. We're excited to be hosted in Atherton by TACTIC: The Arts Council Tablelands Inc. Hope you can join us at the Silo Road Theatre! Tickets through the link below and also available in town at Uptown Music, 7 Atherton-Herberton Rd, Atherton, call 4091 2874. For more information please call 0490 022 847. We are so excited to begin our Savannah Way exploratory tour! We're heading from Cairns all the way across to Broome in WA, and for us there is no better way to start then with a concert. Join us in the beautiful acoustics of St Monica's Cathedral, under the unique 'creation windows' - epic stained glass works by Gerry Cummins and Jill Stehn. Tickets available at the door, card or cash: $25 / $20 concession / $15 student. Call Chris on 0434993973 to pre-book or for further information. We're delighted to be starting our tour in Central West NSW with a series of concerts and workshops hosted by the Mitchell Conservatorium. Last stop is Lithgow, details and tickets through the link below. We're delighted to be starting our tour in Central West NSW with a series of concerts and workshops hosted by the Mitchell Conservatorium. Playing in The Orchard Room in Bathurst! Details and tickets through the link below. We're delighted to be starting our tour in Central West NSW with a series of concerts and workshops hosted by the Mitchell Conservatorium. First up is Forbes! Details and tickets through the link below. Hosted by the Young Music Society of Canberra, Wild Strings is a 5-day music intensive for young people directed by our violin/fiddler Chris Stone. The camp offers an opportunity to explore different genres on violin, viola, cello or double bass as well as improvisation and self-expression through music in a fun and supportive environment. Click the link below to read more! Holly and Chris will be teaching at Stringmania - a celebration and exploration of the traditional arts - music, dance, language and song. Chris is the Australian director, head to the website for all the info and come along! We are looking forward to playing in this Swedish seaside city, near it's famous castle! We are delighted to be returning to perform at this wonderful festival in Finland again. We are delighted to be playing a concert in Helsinki featuring collaborations with our friend and Kantele player, Senni Valtonen. Chris and Holly are both teaching at the inaugural Winter camp for strings run by the Young Music Society in Canberra. This is a fantastic new initiative for young string players to explore different styles of music and techniques. With Chris as director it is sure to be a lot of fun! We're playing at the Majestic - come and hear some new music from our latest album 'Iterations' alongside some older favourites! We're playing at the Trocadero - come and hear some new music from our latest album 'Iterations' alongside some older favourites! Come along to hear us play something totally different....a Beach Boys cover! Part of the very entertaining yearly competition at the Folk Festival that features versions of different popular artists or genres. Cheer loudly to get us through to the finals! Join us at the Budawang to help launch our fifth album 'Iterations' out into the stratosphere! If you are in the area and are interested in coming along email us at thestringcontingent@gmail.com or call 0434 993 973 for more details. We are looking forward to returning to perform in the unique cabaret cinema setting of Nest Cafe. Dessert canapes are inclusive in ticket price and bookings welcome for pre-show dinner to make it an extra special night out. Book your ticket now through the link below or check out www.cafe-nest.com for more details. BYOG: Bring Your Own Grandparent! Come along to the Sound Shell at the Temora Railway Precinct to share an evening of music with someone older that you - grandparent, sibling, neighbour, aunt or uncle... Free event, bring your own chair, drinks and nibbles too! Join us for 'Beats & Bites' at Kettle & Grain, the funkiest venue in Young. Tickets $35 including pizza and music, and can be booked through the venue or at the Young Regional School of Music. We are delighted to be returning to Gunnedah for a week long residency facilitated by Gunnedah Conservatorium in celebration of their 30th anniversary, including performances and workshops throughout the week. More details coming soon! Chris and Holly will both be in attendance at the inaugural Stringmania! camp - Stringmania! is a celebration and exploration of the traditional arts - music, dance, language and song - set in the beautiful Yarra Valley of Australia. Chris and Graham will be joining the teaching team put together by Scottish fiddle legend Alasdair Fraser and brilliant cellist Natalie Haas for the 30th annual fiddle camp held at the Gaelic college on the beautiful Isle of Skye. The second installment of our artistic residency will culminate with the recording of our fifth album and you are invited to be part of the recording process! We'll be recording live in the beautiful acoustics of the Windsong Pavilion and you can come and be a fly on the wall (or cheer loudly or ask lots of questions) - tickets available through the web link below. We are delighted to be recording our fifth album in this beautiful space - you can follow the full process and even be part of it by attending one of our concerts that will be recorded live! Come along for an evening of fine music, wine, cheese and company in the beautiful acoustic space of The Priory. Tickets $30 and include refreshments. Bookings essential for catering purposes, please email amadis.lacheta@gmail.com to reserve your seat. Join us at the ever-quirky Camelot Lounge for a concert featuring new material to be recorded later in 2016. Doors from 7pm, food and drinks available, pre-booked tickets attract a discount! If you are in the Sydney region and interested in attending this house concert please email thestringcontingent@gmail.com for more information. If you are in the area email us at thestringcontingent@gmail.com for more information. We are stoked to be joining the fantastic lineup of Jamgrass 2015, get your tickets quick. Join us in Candelo! Tickets $20, $15 concession, supper provided. Contact info@cas.org.au for bookings and further information. 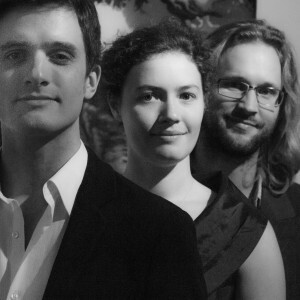 Holly and Chris are both members of the Canberra based chamber music group, The Griffyn Ensemble. Alongside their 2015 season, The Griffyns are running a series of concerts to showcase the diverse musicianship of its members. 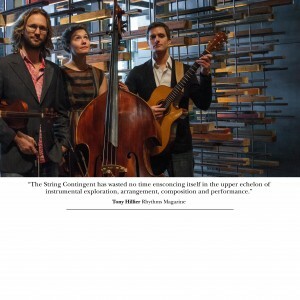 Thus, The String Contingent will be performing a concert at Griffyn Headquarters, Belconnen Arts Centre. Doors at 7pm when the bar will be open. Click the link below to get your tickets! Looking forward to performing in Newcastle again at the grooviest venue in town. Click the link below to buy your tickets now. Tickets $25/20, doors from 7:30pm, music starts at 8pm, Call 0422 987 581 for more info. One of our favourite small town festivals, come along. We are returning to Auckland, this time hosted by Second Hand News at the Old Folks Hall. Join us for an acoustic concert, nibbles and drinks available by donation. Pre-purchase your tickets through the link below to save: $20 pre-paid, $25 at the door on the night. Join us for an acoustic concert hosted by the Hamilton Acoustic Music Club. Pre-purchase your tickets through the link below to save: $20 pre-paid, $25 at the door on the night. Join us for an special night of music in Wellington. Pre-purchase your tickets through the link below to save: $20 online, $25 at the door on the night. Looking forward to returning to the beautiful historic building, Fairfield House. Pre-purchase your tickets through the link below to save: $20 pre-paid, $25 at the door on the night. We are so pleased to be returning to Christchurch to play an acoustic concert in The Big Room at The Addington Haven. Pre-purchase your tickets through the link below to save: $20 pre-paid, $25 at the door on the night. This promises to be a beautiful weekend of music in the bush. Come along for a free evening of music hosted by The Old Bridge Inn and pop in for dinner before hand. Call 01479 811137 for more information. Looking forward to some fine coffee and sweet treats alongside a lovely acoustic concert in the town Graham is from. Looking forward to playing at this great venue. Tickets at the door. To book your ticket email us at thestringcontingent@gmail.com, exact address provided on booking - get in quick as space is limited. Looking forward to our last concert for the Live at Heart Festival in the beautiful Nikolai Church. Looking forward to our first concert as part of the Live at Heart Festival in Sweden. Looking forward to another great festival weekend, this time in the beautiful Purbeck Valley. Join us in London, see harrisonbar.co.uk for more info or click the link to book now. Looking forward to this performance at Broadstairs Folk Week with support from the amazing Tim Edey, BBC folk musician of the year, 2012. Delighted to spend a week by the sea performing at the renowned Broadstairs Folk Week. Chris and Graham will be joining the teaching team put together by Scottish fiddle legend Alasdair Fraser and brilliant cellist Natalie Haas for the 29th annual fiddle camp held at the Gaelic college on the beautiful Isle of Skye. If you happen to be anywhere near Malta and would like to come along to this show let us know. Kaustinen Folk Music Festival "marks the spot for the happiest days of the summer" and we are excited to be a part of it! The festival has been organized since 1968 to uphold and celebrate the strong folk music and dance tradition in the area. Kaustinen has taken a powerful role as a meeting point for folk music folk from near and far: Thousands of amateur and professional musicians and dancers from all over Finland and around the world strike a common chord here every summer. Contact johnpamlizzie@hotmail.com for more information. Join us for an acoustic concert in the lovely space of the Mechanics Institute Hall. Tickets available at the door: Adults $25, concessions $20, children $10. 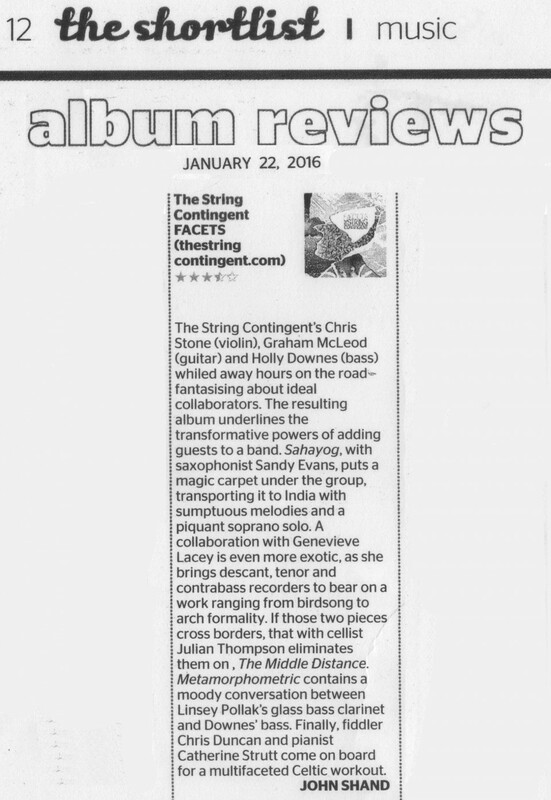 To book, email thestringcontingent@gmail.com or call Chris on 0434 993 973. A light supper will be provided. For bookings and further information call Amanda on 0401 950 517. Special FREE concert presented by Wagga Wagga Art Gallery with support from Arts NSW. Seats are limited so bookings are essential: email gallery@wagga.nsw.gov.au or phone the Gallery direct on 0269 269 660 to secure your place. Drinks and nibbles will be provided. If you are in the area and would like to come, please contact us for further information: thestringcontingent@gmail.com or call Chris on 0434 993 973. Tickets $25 pre-booked, $30 on the night. Doors open 7pm, delicious food and drinks available. 6-piece ensemble Chaika create a beguiling & original sound-world, blending 4 part female voices with clarinet, violin, piano, accordion, double-bass, guitar & percussion. Chaika draws influence from folk traditions, jazz & classical music. Described as cinematic, deeply touching and meditative, as well as exuberant, virtuosic & uplifting, Chaikas strength is the elusiveness of their style, gently wandering through foreign lands, through storms & through stories, emerging rich with experience & an enchanting tale to tell. Dear all, we are very sorry to announce our concert at the Church of Groove has been cancelled due to the weather. Official advice is not to commute unless strictly necessary today in the Newcastle area, and we feel it would be unsafe and thus irresponsible to host a concert at this time. We will be rescheduling the concert for our October tour. Till then stay safe and dry! For more info contact churchofgroove@gmail.com or call 0401 342 030. On The Rocks present a candle-lit evening of exceptional musical entertainment right in the heart of Sydneys west, featuring folk trio The String Contingent and singer-songwriter Rachel Collis. Indie-folk singer songwriter and pianist Rachel Collis moves seamlessly between earnest folk storytelling and humour, showcasing her exceptional versatility as a songwriter, her fine ear for beautiful melody, and poetic lyrical talent. Her exquisite song-crafting and unforgettable live performances have been met with hyberbolic acclaim by the critics. On The Rocks will take place at North Rocks Community Church (134 North Rocks Rd, North Rocks), at 7:30pm on Friday April 17. Tickets are $35 full/$30 concession. This is event is BYO and a light supper will be provided. Join us for a live online concert from the comfort of your lounge room! We will be up at 6 am to play for all our friends and fans over the other side of the world! Earliest gig ever for us! Lucas was born in old mountain country North Carolina and raised in Alaska - you can hear these places in his songs. He has won American and Australian songwriting awards, shared the stage with such artists as Jim White (The Dirty Three), George Xylouris, Matt Hopper, Shenandoah Davis and toured in the US, Canada, Europe, Asia, New Zealand, and Australia. Lucas is currently based in Melbourne, Australia and makes a living as a carpenter when not playing music. Book tickets through the link below. Full $20, Concession $15, CMC Members $10. Musicians and lovers of music can join the CMC by direct deposit or by cash on the night. See their website, email ourcmc@gmail.com or call 0401 084 773 for details. If you are in Perth and would like to come along contact johntroy@iinet.net.au for further information. We are looking forward to returning to this fantastic festival, hope to see you there! We are excited to be launching our new collaborative album, Facets, in a special, one-of-a-kind concert with the guest artists who feature on the CD. This is the only TSC concert at the festival, but keep an eye and ear out for Holly and Chris performing with the Lucy Wise Trio and The Griffyn Ensemble. Unfortunately this concert has been cancelled due for unforeseen circumstances. Our sincere apologies. Donation $20, wine and finger food provided. Contact thestringcontingent@gmail.com for more information. Join us for the unique house concert experience that is Humph Hall. Recommended donation $25, Concessions $20. As Humph Hall seating is limited, bookings are strongly advised, contact Wayne Richmond on (02) 9939 8802 or email wayne@humphhall.org. Bookings essential via the ticketing link above or contact Emma Avery on 0428 195 108 or emma.avery10@gmail.com for further information. Join us in Newstead for this long weekend festival, lots of great music in a small town setting. We are performing acoustic concerts in the Anglican and Uniting churches on Saturday and Sunday afternoon, and at the Troubadour venue on Saturday night. See you there! Looking forward to our only Melbourne show on this tour! Bookings essential, contact Barb direct on 0427 302 807 or email kewhouseconcerts@gmail.com. Address provided on booking. Donations $20, supper included and BYO welcome. TSC are very sorry to have had to cancel this concert due to illness in the band. We will reschedule for later in the year so keep an ear out! Apologies for any inconvenience caused. The Canberra Young Music Society (YMS) are running a series of Summer Festival concerts to showcase professional staff ensembles who are participating as part of the 2015 Summer School. We are one such ensemble and are delighted to be performing for both the participants of the Summer School, their families and the general public. For further details and tickets please click the link below. The String Contingent are looking forward to teaching at this 2-week summer camp for the first time. All sydney-siders are invited to join us for a special house concert in sydney. If you would like to come along please contact Jerry on 8587 7419 (work) or email jerry.reilly@thomsonreuters.com Places limited so please book early! Admission at the door $25, concessions and Gunning Focus Group members $20. Bookings and enquiries to Michael Coley, 0417 663 045 or michael.coley@bigpond.com. Presented by Gunning Focus Group. Unfortunately this concert has been cancelled. We apologise for any inconvenience caused and look forward to playing in Melbourne again in the future. Please join our mailing list by clicking the link on the left-hand menu if you would like to know when the next concert will be. Join us in the very cool space that is the Lot 19 Arts Hub. Details through the website below. Please email thestringcontingent@gmail.com for further information if you are in this area! We're delighted to be returning to perform for the wonderful Wauchope community. Tickets at the door from 7.30pm - $25; $20 members, see the Wauchope Arts website for further information. Looking forward to sharing our music once again in the great acoustics of Oddfellows' Hall, $25 with supper included. See the facebook page for more details or call Kim on 02 6226 1796 to book now. Contact John at johnpamlizzie@hotmail.com if you are in the area and would like to come! Benalla Gallery has become a regular stop on our frequent trips up and down the Hume highway. Often it's for the coffee but sometimes also for the privilege of playing amongst the beautiful art! Tickets at the door: adults $25, concession $20, primary and secondary students free. This promises to be a special evening in a special space - Tickets $25, BYO drinks and supper plate or enjoy the coffee and cake that will be available. See the facebook page for more information or call the wonderful Helen on 0402 987 641 to book now. While The String Contingent take a break you can still catch Holly (double bass) and Chris (violin) alongside the wonderful singer-songstress Lucy Wise on the road throughout October. Full details at Lucy's website. We're looking forward to returning to the fantastic Fairbridge Festival over the weekend of 26-28th April - checkout the website for full line-up and event info. Join The String Contingent for an exclusive acoustic concert experience in Adelaide as part of our album release concert series 'Acoustic 50/25/5'. There are 50 seats per show, $25 tickets, in 5 capital cities. This is your chance to hear our new album 'Talk' performed live in a specially selected intimate space before The String Contingent take an extended break from touring. Bookings are essential, and tickets are strictly limited, so book early by clicking the stickytickets link below to avoid disappointment. Drinks and food available at the lovely Artisan Cafe. Join The String Contingent for an exclusive acoustic concert experience in Melbourne as part of our album release concert series 'Acoustic 50/25/5'. There are 50 seats per show, $25 tickets, in 5 capital cities. This is your chance to hear our new album 'Talk' performed live in a specially selected intimate space before The String Contingent take an extended break from touring. Bookings are essential, and tickets are strictly limited, so book quickly by clicking the Stickytickets link below to avoid disappointment. The Bishop's Parlour is on the ground floor of the Convent Building - head to the Abbotsford Convent website for extensive visitor information. Join The String Contingent for an exclusive acoustic concert experience in Sydney as part of our album release concert series 'Acoustic 50/25/5'. There are 50 seats per show, $25 tickets, in 5 capital cities. This is your chance to hear our new album 'Talk' performed live in a specially selected intimate space before The String Contingent take an extended break from touring. Bookings are essential, and tickets are strictly limited, so book quickly to avoid disappointment by clicking the stickytickets link below. April 2, 2013 @ 12:00 am - Lucy Wise & The B’Gollies Album Launch Tour! 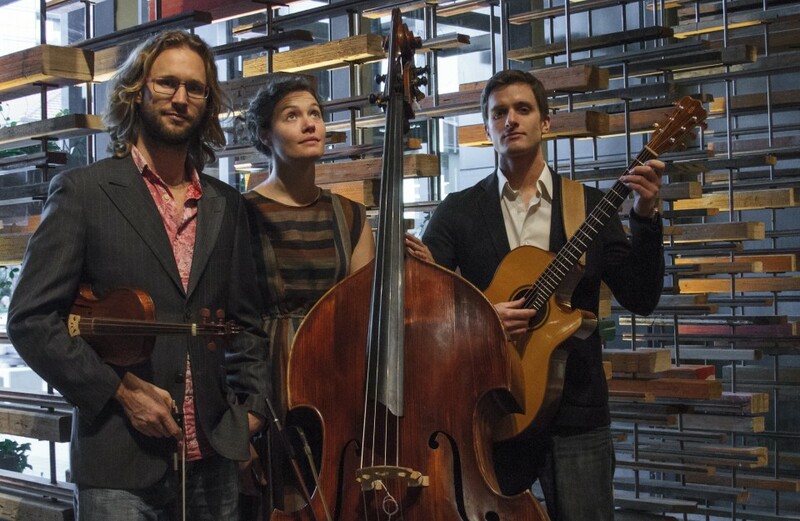 The String Contingent don their B'Golly hats for a two week 'wander' around VIC, ACT and NSW to launch Lucy's much anticipated second album of original songs 'When we wander far from home' See her website for full tour details! Concert in the groovy space that is The Royal Exchange. Doors at 7pm come and have a drink before the music starts 7:30pm. Tickets $20. Call (02) 4929 4969 to book or see the website for more info. Join The String Contingent for an exclusive acoustic concert experience in Brisbane as part of our album release concert series 'Acoustic 50/25/5'. There are 50 seats per show, $25 tickets, in 5 capitol cities. This is your chance to hear our new album 'Talk' performed live in a specially selected intimate space before The String Contingent take an extended break from touring. Bookings are essential, and tickets are strictly limited, so book quickly to avoid disappointment by clicking the stickytickets link below. Venue TBA - call the music centre on (02) 6742 3998 for bookings and more information. We're looking forward to playing in this beautiful acoustic space - Tickets $20, kids free and refreshments included! Call 02 6226 1796 for bookings and more info. Looking forward to returning to the lovely acoustic space of the Benalla Art Gallery. Tickets $25/$20 with full time students free! Telephone (03) 5760 2619 or email gallery@benalla.vic.gov.au for bookings and more information. Join The String Contingent for an exclusive acoustic concert experience in Canberra as part of our album release concert series 'Acoustic 50/25/5'. There are 50 seats per show, $25 tickets, in 5 capitol cities. This is your chance to hear our new album 'Talk' performed live in a specially selected intimate space before The String Contingent take an extended break from touring. Bookings are essential, and tickets are strictly limited, so book quickly to avoid disappointment by clicking on the Stickytickets link below. Join us for a very special evening of music and a full Lebanese banquet including desert - yum! Call 02) 6452 4512 to book your table. Join us for an acoustic concert in Tumbarumba hosted by Eastern Riverina Arts - Book your ticket online through the link below or email info@easternriverinaarts.org.au for more information. Full details for this concert hosted by the Riverina Conservatorium will be available shortly. We're delighted to be returning to Wagga for some instrument workshops hosted by the Riverina Conservatorium. Join us for an acoustic concert in the town of Murrumburrah (near Harden) hosted by Eastern Riverina Arts. Book online through the link below and email info@easternriverinaarts.org.au for more information. Tune in to your local frequency or listen online! Tune in locally or online to catch our live performance and chat with Jon Faine and others. This will be a unique album launch concert for our third full album titled 'Talk'. Programmed as part of the Newstead Live! Festival weekend (25-27th Jan, see website for details) we will be performing music from 'Talk' in the beautiful acoustic of the Newstead Uniting Church where the album was recorded. 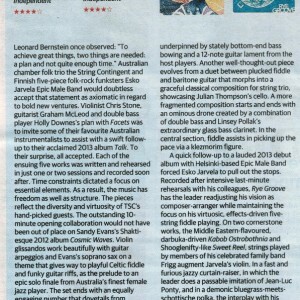 The String Contingent's guitarist Graham McLeod has convinced his fellow Scotsmen to come to Australia through tales of sunshine and fun times! Join the celtic/funk groovesters Modhan on their six-week Australian tour which will include the Illawarra Folk Festival, Newstead Folk Festival and Cobargo Folk Festival - more info on their website! We're looking forward to a great weekend at this great festival - book your early bird tickets now! We are very excited to playing for this fantastic festival - no excuses for all you Brisbanites as our performance is part of the FREE program of the festival!! For bookings and more information contact Mike or Wendy on 4845 1566, 0417 663 045 or at michael.coley@bigpond.com. Join us in the lovely hall of the Wauchope Arts Council for a great night of community and music. We're delighted to be performing as part of this great festival on the NSW south coast. We look forward to performing a concert in this beautiful acoustic space as part of the 'Simply Music' series. 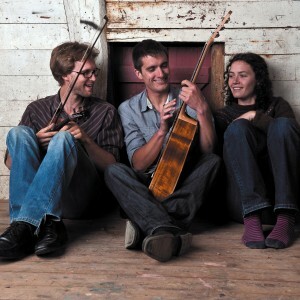 Chris will be tutoring at this weekend fiddle camp along side Hanneke Cassel, George Jackson and Karen & Jacko Jackson. 2012 Camp runs from Friday 28th September to Monday 1st October on the beautiful Sunshine Coast so book in early for a beach holiday with fantastic fiddle skills to learn on the side! Graham and Holly will be teaching alongside a wonderful array of tutors at Roses Gap Music Camp. Held over the weekend of 28th Sept - 1st Oct in the beautiful Grampians, this weekend of music and dance gets booked out quickly - for more details click the link below and get in early! Join us for a concert in support of the Africa Clean Stoves project. Based in Tanzania, the project aims to replace smoky charcoal and wood burning stoves with smokeless pellet burning pyrolytic stoves. For further information about the project visit www.africacleanstoves.org. Entry is $20 adults, $40 family payable at the door – afternoon tea is included, so how could you say no?!? Peter Daffy is kindly hosting a concert at The Court House after a day of workshops at local schools. Please come along to hear us play in the natural acoustics of the Court House. Tickets at the door, $20/$10 student. Join us for an early evening of music in the tranquil town of Mallacoota. Contact Janice Wright on 0422 988 890 for more info, otherwise see you there! Nestled next to one of the largest rain-forests in Queensland, this festival is a perfect excuse for a tropical holiday - hope you can make it! We're looking forward to our first trip to the Mount Beauty Music Muster - hope to see you there. April 21, 2012 @ 4:00 pm - Special Event – Fundraising Ceilidh to Cure Cancer with a Spanish twist! Join us for an evening of music, dance and food in support of our friend Sebastian Loeda as he undertakes the Great Ocean Road marathon to raise money for Cure Cancer Australia. We are providing a concert set of music and then breaking into a true Scottish Ceilidh with dances called in expert fashion by TSC's Graham McLeod. Click the link below for more information and to by your tickets - early bird prices available before April 7th! Come to the National Library of Australia (NLA) Concert on Easter Sunday to see Chris and fellow fiddler/researcher Emma Nixon present the findings from their National Folk Fellowship, a project on Scottish Fiddle music in Australia. They will be joined by Holly, Graham and Brisbane guitarist Tony Vandemeer to perform a selection of Scottish tunes discovered in the NLA archives and will be launching a CD and music book of the material at the festival. The String Contingent will be at the festival all Easter long weekend, so look out for posters detailing our special festival concerts slots! BOOK NOW - Seats are limited!!! $20 Presale / $25 Door, available from the venue 09 446 0100 or click the link below. Doors at 7pm, show starts 7.30pm. Come along to The Vic Theatre to experience a smorgasbord of some of Auckland's burgeoning talent in new acoustic music, with special guests from Australia, The String Contingent. We're really looking forward to returning to Christchurch - come join us at Christine and Charlie's place. Numbers limited so get in touch with us on thestringcontingent@googlemail.com to book your seat or for more information! Join us for a great concert - dinner and drinks available at this great venue, so bring your friends and make a night of it! Contact Peter Madill on 034879999 for more information. Come along for a great night of music at Brad & Chrissy's beautiful place. Contact bradmac@woosh.co.nz or call Brad on 03 9310599 or 0274581296 for more info or to book your seat! Come along to this great festival in Yack - we'll be around on the Saturday and Sunday - hope to see you there! This concert will be a special one - the debut performances of new pieces that will be the results of a week and a half artistic residency at Cowwarr Art Space! Book Now: 03 51489321 or artspace@cowwarr.com Tickets $20 concession $15 Family $50 (2 adults and 2 children) Pre Booking preferred for seating arrangements and table bookings. Last minute decision on the night are still welcome. We would hate you to miss out. The Artists Bar will be open serving our favourite Narkoojee wine's and the Coffee Machine will be hot. Join us at the lovely Burrinja Cafe for a night of fine food and music. Book tickets through the venue at the link below - Dinner available before the show, call to reserve your table on 03 9754 8723. We are looking forward to our first trip to the Nannup Music Festival in Western Australia - We'll be playing as The String Contingent and also as Lucy Wise & The B'Gollies. Keep and eye out for more WA dates around this time! A wonderful summer evening celebration of acoustic music from Lucy Wise and The B'Gollies + The String Contingent, on Gary and Laura's deck in Hamilton Hill, WA. Doors open 7pm. Tickets: $25 adult / $15 concession. Tea, coffee and nibbles provided, BYO other drinks. Seats are limited, so bookings are essential! Venue address will be provided on booking. Book tickets via paypal on Lucy Wise's website at www.lucywise.com.au or send an email with the subject line: Hamilton Hill House Concert to lwisemusic@gmail.com for reservations and instructions on other payment methods. We would love to see you all there! A great festival situated in a lovely part of the world. The String Contingent will be playing on both the Saturday and Sunday of this festival - see you there. Radio National, tune in to your local frequency or listen live or in retrospect on the web. Join us for a concert on a island off and island off and island! Bookings essential, email our lovely hosts Ueli and Martina on info@mickeysbay.com BYO and a plate to share, Tickets $15. Join us for a night of music and wee dram or two at the wonderful Lark Distillery. Click the link below to book your tickets (cheaper then paying at the door!) See you there. This promises to be a friendly an fun concert to kick start our Tasmanian Tour - If you're in the area and can come along RSVP with numbers to chris@csetas.com.au or 0364283994 to reserve tickets ($20/kids free) and pay on the day.BBQ provided - byo food, drinks and chairs! 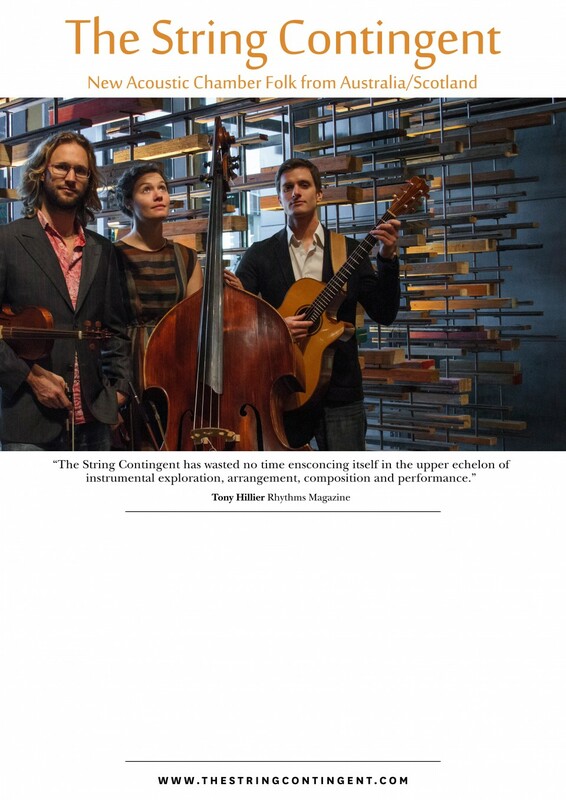 The String Contingent regrets to announce that our upcoming concert at Sturt Cafe on Saturday 11th of February 2012 has been cancelled due to issues with the management of the venue. We value the co-operation of the many venue managers with whom we have worked in the past in order to present the best quality live music in an accommodating atmosphere. Unfortunately, it has become evident that this will not be possible at Sturt Cafe. This is the first concert in over two years of touring that we have had to cancel, and we do apologise for the inconvenience. However factors beyond our control have given us no option. All pre-sales we will be refunded through Paypal. We hope to return to the area soon at a more suitable venue. Chris, Holly and Graham, ‘The String Contingent'. Multiple tickets may be selected on the paypal checkout page. No physical ticket shall be sent to save the forests - instead your name and booking details will be checked at the door on the night - see you then! We'll be popping into this lovely market between 9.30am and 1pm on our way up the coast to play some music and sample the local goods - Concert in Dorrigo in the evening! Join us for a concert hosted by the excellent guitar workshop Caldersmith Lutherie - Call Graham Caldersmith or Angela MacPherson on 02 6550 4068 to reserve your spot or for more information. Join us in the great space that is Humph Hall - contact Wayne Richmond on 02 9939 8802 to reserve your seat or for more information. Come along to this great festival for a weekend of fun and music - catch us The String Contingent and also as Lucy Wise & The B'Gollies. House concert - get in touch if it's near you! Join us for a special concert to launch our new album TSC II in Melbourne. Doors 7.30pm for an 8pm start, Tickets $20/$15 - supper provided! Join us for a very special evening at this great venue. Come early to nab the best couch in the house and nom down some tasty dins before the music begins at 8.30pm. Pre sales have been disabled due to unforeseen circumstances. Tickets will be sold at the door only, so please arrive early to ensure you get a seat. Looking forward to returning to the Illawarra Folk Festival this week. We're doing a workshop as part of the Festival Folk School on Thursday morning (12th) and We'll also be playing with Lucy Wise & The B'Gollies, so keep an ear out! 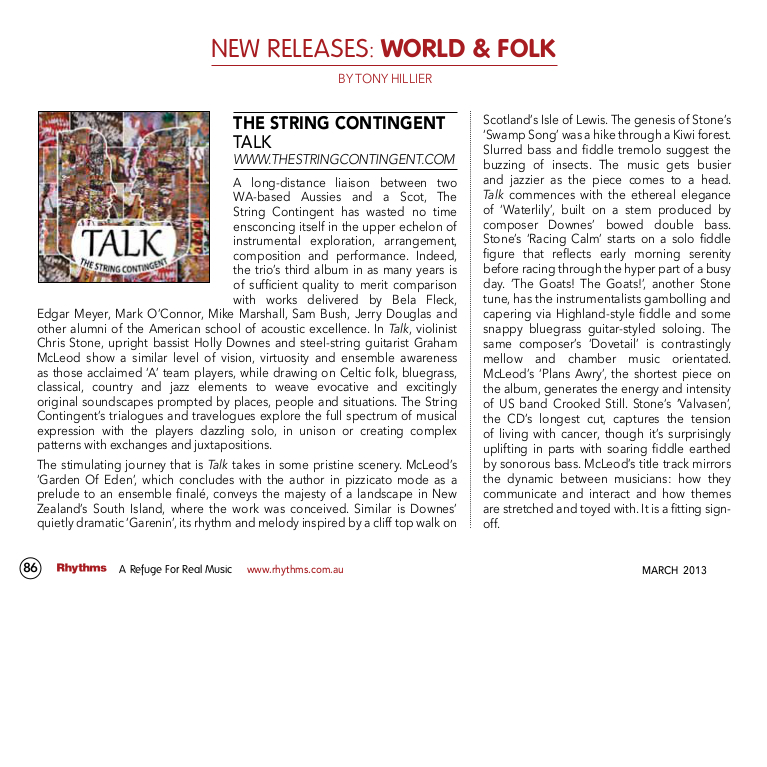 January 7, 2012 @ 7:30 pm - Lucy Wise and The String Contingent – Split-bill mini-tour! Join us at this great venue for a night of good music. Call (02) 4929 4969 for more information or check The Royal Exchange website. 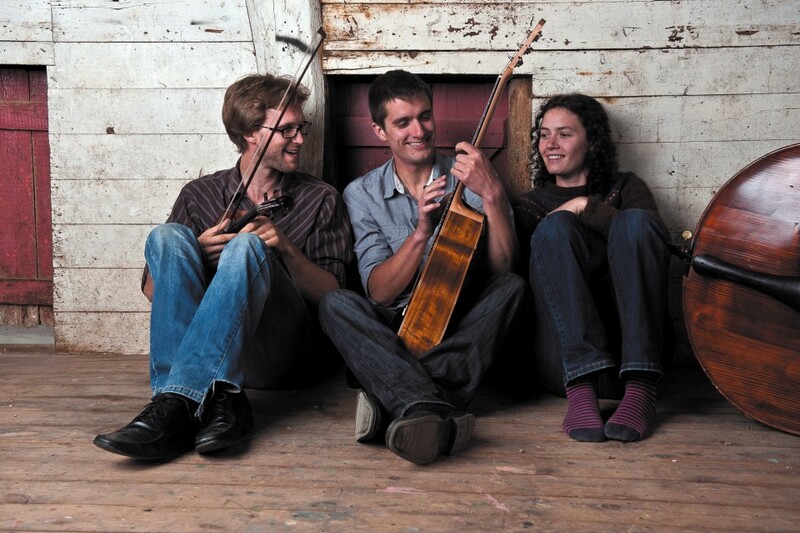 January 6, 2012 @ 7:00 pm - Lucy Wise and The String Contingent – Split-bill mini-tour! January 5, 2012 @ 7:30 pm - Lucy Wise and The String Contingent – Split-bill mini-tour! Join us for this great house concert event - all welcome! Email Paul Kimmel at houseconcertsos@aol.com to reserve your place or for further details. Join us for a fun and friendly weekend at this great little festival. Join us for a lovely evening hosted by the Gippsland Acoustic Music Club. Call Barb on 5174 7903 for more info and see www.arcyinnar.org.au for more info about this great venue. We're looking forward to our first trip to this festival - We will also be playing as Lucy Wise & The B'Gollies, so keep and ear out, www.lucywise.com.au. See you there! Come along to hear the quintessential Scottish fiddler Alasdair Fraser in perfect combination with the brilliant cellist Natalie Haas - this duo are hugely influential in the Scottish fiddle scene both in Australia and abroad. Their performances are engaging, enlivening and equally refined and boisterous where appropriate! Tickets through The Boite (boite.com.au) or call 9417 1983 - definitely not to be missed. Everyone is welcome at this special event hosted by Holbrook Public School in their new hall. We are playing a concert following an afternoon of workshops with the students. More details soon! We're delighted to be heading across 'the ditch' for this long weekend festival. Join us at this exceptional event in support of CuriousWorks - a company who's goal is to "subtly reshape the systems of cultural production in Australia, for the benefit of all Australians...instigating a more diverse, more accessible, more surprising, more imaginative arts and media scene in our home country." $15 tax-deductible donation at the door, drinks and nibbles available - see you there! We hope to see you at this great one-day mini festival hosted by the Illawarra Folk Club - Tickets are limited so book early! October 15, 2011 @ 7:30 pm - Combined Concert and Ceilidh Dance! Come along for a great night of music and dancing! First up is local band Cider Jam, followed by a String Contingent concert set and then breaking into a traditional Scottish Ceilidh dance led by our guitarist, the authentic Graham McLeod - An inclusive, fun form of dance where prior experience is unnecessary...there are strong rumours that kilts will be worn! For more information call Ronnie or Sue on 02 4441 1172. Tomerong Hall, Tomerong School of Arts, 358 Hawken Road, Tomerong. Join us for a great night at this well established folk club. Sandhurst Football Clubrooms, Under the Grandstand at the Queen Elizabeth Oval in View Street, Bendigo. Tune in to the Arts Café with presenter Phil Birch-Marston to hear a live interview and performance - catch us in Canberra that night at Wesley Music Centre! Join Holly and Chris from TSC as they put their B'Golly hats on for Lucy Wise's official debut CD launch. Also launching their debut EP is the excellent duo of Evan Davies and Mischa 'B'Golly' Herman (www.cyclerecording.com.au/clients/evan-and-mischa)- this is an evening that is not to be missed. Our new EP 'TSC Live' will be featured on this edition of the music program, The Weekend Planet, in combination with Lucy Wise's debut album 'Lucy Wise & The B'Gollies'. Tune in to hear what the presenter, Doug Spencer, has to say about our music. Performing with Lucy Wise as her backing band 'The B'Gollies'. Split bill with TSC and Lucy Wise and The B'Gollies. Second WA gig! Split bill with The String Contingent and Lucy Wise and The B'Gollies... first TSC gig in WA! Performing as Lucy Wise's backing band 'The B'Gollies. Come along for a great night on the Central Coast - see http://www.troubadour.org.au for more information. Tune in online at http://www.triplehfm.com.au/hhh/shows/sb or on 100.1 FM if you're in the Sydney area to hear us interviewed leading up to our concert at the Hornsby Folk Club. April 2, 2011 @ 6:00 pm - FrogFest – note change of venue! This promises to be a great evening of music at the excellent Sassafras Creek Cafe of Kurrajong village. Complimentary canapés served from 6.30pm. Bookings essential, contact Sassafras on (02) 4573 0988 for more info and to reserve your place! Join us for a great night of music at this lovely venue: For Bookings Contact Carolyn @ the Cowwarr Art Space: 03 51489321 or artspace@cowwarr.com Tickets $20 concession $15 (Credit Card Phone Booking Facilities) Pre Booking preferred for catering and seating arrangements. Last minute decision on the night welcome. We would hate you to miss out. The Artists Bar will be open and the Coffee will be hot! House Concert at Melody's... Partay! March 18, 2011 @ 7:30 pm - Ceilidh Dance!!! Come along for a fantastic night of dancing, fun and games of a Scottish nature - As you may or may not know, a Ceilidh is a social event and dance, originating in Scotland or Ireland, depending upon who you ask. This one will feature awesome traditional tunes from The String Contingent and relaxed, simple dances, taught in an authentic manner by Scotsman Graham McLeod, who has been playing for and calling ceilidhs for many years throughout Scotland, the UK, and Europe. No dancing experience or partner is required - we promise! Concert as 'The B'Gollies' with Lucy Wise. Visit www.myspace.com/lucywisemusic for more details. Split Bill with Colectivo 29, a fantastic tango band! We may tangle for a tango or two... visit www.colectivo29.com for more info. House Concert at Milly's House. Come along to this great concert as part of the 'Live at the village' concert series showcasing original music. 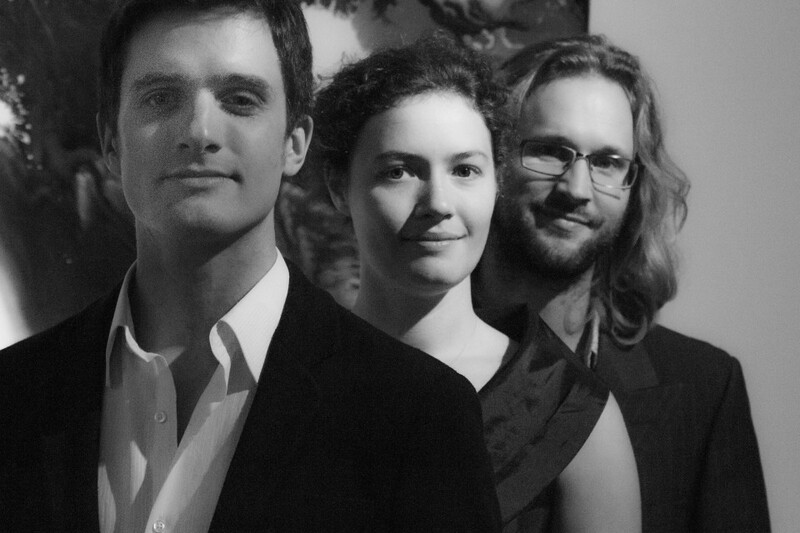 We're honored to be supporting the award winning Jonathan Zwarts Quintet. Formerly the Allambie Heights Uniting Church, Humph Hall is now part of a private home and will be a superb acoustic venue for us to perform in. For bookings and more information contact Wayne, (02) 9939 8802, or check out Humph Hall's page http://humphhall.org/ 85 Allambie Road, Allambie Heights. If you're in the Northern Beaches of Sydney email us at thestringcontingent@googlemail.com for more info. Come along for a great night at the wonderful Merry Muse. Support by The Shiny Bum Singers - public servants at their best! Come along for a great night at the Braidwood folk club - Contact Sue Rendell on 02 4842 8142 for more info. House Concert on the South Coast at Ronnie and Susie's place - contact us at thestringcontingent@googlemail.com for more info if you're in the area. A concert... in a cave! Come along for a great night of music at the Riverina Conservatorium of Music. Tickets at the door $20/$15 Concession. Call Jeff Donovan for more information on 0428 695 577. The String Contingent invites you to join them for this very special performance at The Toff: The concert will be filmed for a live DVD which will not be available for commercial sale. Those attending the concert will receive a copy of this limited edition DVD....for FREE! So please invite your friends and come along for this one off evening of outrageously good music! Limited tickets are available due to filming/seating restrictions, so please pre-book tickets early (just click the green $ sign above).The String Contingent will be supported by the wonderful Lucy Wise, who sings original songs rooted in Appalachian and Irish folk music and influenced by pop and whatever else has floated by throughout her musical years. She started out playing and singing with her family in the Wise Family Band, and is now amongst the most renowned young players and songwriters in the Australian folk music scene. Come and join us for the festival we most enjoyed last year... great music, great town, lovely people, can't go wrong! Join us at this unique B & B where stargazing and music can go hand in hand. Reservations required - email info@stargazersbb.com for more details. Concert at Bennetts Chocolatier... yum! Join us for a great night of music with great hosts - Reservations essential - email us at thestringcontingent@googlemail.com for more info. Le Cafe is a lovely cafe overlooking the bay in Picton, New Zealand. Great food, great acoustics, will be a great evening. Join us for what promises to be a great House Concert in Invercargill. Concert on the Isle of Lewis at An Lanntair, part of our Western Isles Tour. Join us out in the wilds of the Hebrides! Concert as part of the Summer Festival on Skye, supporting Iain MacFarlane from Blazin' Fiddles - see http://www.seall.co.uk/index.asp for more info and read on for details of the main event! Uisge-Beatha; A Highlander's Celebration of Whisky Welcome to the world of whisky! Accomplished Glenfinnan musician and Blazin' Fiddler, Iain MacFarlane has created a stunning show of music, song and visuals celebrating our national drink. Originally commissioned and debuted at the Blas Festival 2009, this show combines Gaelic and English song with traditional and contemporary Highland music all relating to 'uisge-beatha', the water of life. Interwoven with the musical sets are stories, recitations and anecdotes which give a humorous yet informative look into the world of Scotland's most famous export. Iain is joined in the show by accomplished musicians/singers Ingrid Henderson and Ewan Robertson and his father, Charlie MacFarlane. Join us at this lovely club - see http://dunfermlinefolkclub.art.officelive.com/default.aspx for more details. Our fiddler, Chris Stone will be presenting a paper at this conference. See the website http://www.abdn.ac.uk/nafco/about/ for more details. Contact us at thestringcontingent@googlemail.com for more information if you are local to the area. June 5, 2010 @ 7:30 pm - House Concert – SOLD OUT! House concert on the Central Coast. 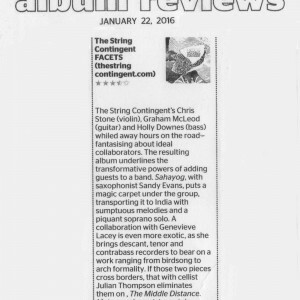 Contact Chris on 0434993973 or email us at thestringcontingent@googlemail.com for more details. June 3, 2010 @ 6:30 pm - Concert at the lovely Sassafras Creek Cafe – SOLD OUT! Join us for a evening of music in the tranquil setting of Kurrajong Village. Canapes provided and drinks available. Tickets $20, prepay online by emailing thestringcontingent@googlemail or in person at Sassafras Creek. For more information contact Diana Morcom - morcom@xtra.co.nz. May 19, 2010 @ 1:10 pm - Concert on the Ferry! Playing for our passage back to the North Island, from Picton to Wellington. Join us at the famous Penguin Club for a great night of musical entertainment. See http://thepenguinclub.co.nz/ for more details. Concert in the lovely Thomas Browns Gallery Space - see http://www.queenstown-nz.co.nz/information/eventList/index.cfm?browseBy=category&categoryid=4 for more details or contact Julie Hughes on arrowevents@xtra.co.nz or phone 027 633 1252. Come join us at the friendly New Edinburgh Folk Club. Promises to be a great concert in a great venue! Join us for a concert in the amazing log cabin pub, renowned for it's brew and food. May 2, 2010 @ 8:25 am - Concert on the Ferry! Playing for our passage from Wellington (North Island) to Picton (South Island) - hoping for a smooth trip! Come along to the first gig of our New Zealand tour! Contact Patricia Heatherington on patricia@masc.co.nz for more information. Concerts and workshops throughout the festival weekend, please go to http://www.snalbans.iwarp.com/main.html for details. Presented by the Monaro folk club - visit http://merrymuse.org.au/wb/ for more details. April 3, 2010 @ 6:00 pm - CD Launch at the National! Come along to our Festival CD launch at the Merry Muse venue - promises to be a great gig. Also look out for us performing at other blackboard venues or lurking in the session bar in the wee hours. Keep your eyes peeled for posters around the festival site for more details. Split-bill concert with Catherine Fraser (www.catherinefraser.com) at the South Australian Folk Centre. We're looking forward to going to South Australia for such a great concert! March 25, 2010 @ 7:30 pm - CD Launch! The Ultimate 'Tri-launch' in the beautiful acoustic of Northcote Uniting with String Theory - www.myspace.com/musicstringtheory4 and Squeebz - www.myspace.com/squeebzmusic Homebaked supper provided Not to be missed! Concert with the amazing Percussionist Matthew Horsley Please email thestringcontingent@googmail.com for more details or call Chris on 0434993973 Born in Brisbane, Matthew Horsley is a highly accomplished percussionist who is currently undertaking a Master of Music Performance (by Research) at the VCA as the recipient of a 2010 Melbourne Research Scholarship. Matthew has performed extensively across classical, jazz, experimental, popular and folk genres, both solo and with artists such as Gary Nesteruk (USA), Andy (Iran), Topology, Clocked Out and The Mute Canary Project.Matthew's current research and performance interests embrace Afro-Cuban religious and folkloric drumming styles and their integration with contemporary classical and jazz languages. In addition, he is an avid student of the traditional music of Ireland and Newfoundland and an active participant in the Melbourne session scene (as well as an inveterate busker) on tin whistles, uilleann pipes and Irish flute. Join us at the Arc Yinnar centre for creativity and contemporary arts in their performance space, the Switchroom. Tickets $20, available from Arc Yinnar on 03 51631310. Concert for Folk Victoria during the Brunswick Music Festival, see http://www.folkvictoria.org.au/melbournefolkclub/calender.html for more details. Join us for a lovely afternoon on Philip Island with the famous Melbourne Scottish Fiddle club. Wine and food platters available. Concerts and workshops over the course of the festival. Please go to www.illawarrafolkfestival.com.au for more details. Concert on beautiful Bruny Island. See www.brunyisland.net/Arts/artsonbruny for more details. With the awesome band Takadimi (www.myspace.com/takadimiplace). See www.republicbar.com for further information. We have several concerts during the festival which runs until the 10th of January - look at http://www.cygnetfolkfestival.org/ for more details. The 28th, biggest, brightest and best Cygnet Folk Festival will launch on Thursday 7 January at the Lark Distillery. Kobya, Pin Rada, Tallulah Rendall, The String Contingent, Gretel Templeton and the Teramachi and others will jam and dance their way around the Lark to celebrate Tasmania’s premier music festival. The festival commences on Friday afternoon with a session in the ’Bottom Pub’ and continues until late Sunday evening with the traditional cabaret in the Carmel Hall. Music and dance fills all the intervening hours at workshops, concerts and sessions. Bluegrass musicians have been known to session for fifteen hours straight, a characteristic welcomed by publicans and coffee houses. The festival’s outdoor program, street parade, 136 acts and market draw more than 5000 visitors to Cygnet for their annual fix of Australia’s most friendly festival. Join us. House Concert at Todd and Astrid's lovely place. Contact Astrid on telopea_tas@yahoo.com.au or 6376 1049 for more details. Jan and Jim's house, Ashgrove, Brisbane.